Microway’s GPU-Checker utility validates a single GPU or a cluster of GPUs from a single interface. GPUs are automatically detected, queried and tested on each system – the user simply needs to specify a list of host systems to test. Harnessing the same tools which Microway uses to verify GPU cluster health, GPU-Checker runs each graphics processing unit through a battery of computational and memory-intensive tests. High-intensity stress tests ensure GPU-dense systems will not overheat under heavy loads. Memory-intense modes validate the local and global memory systems. Memory check modes also catch errors on GPUs which are running with ECC disabled. 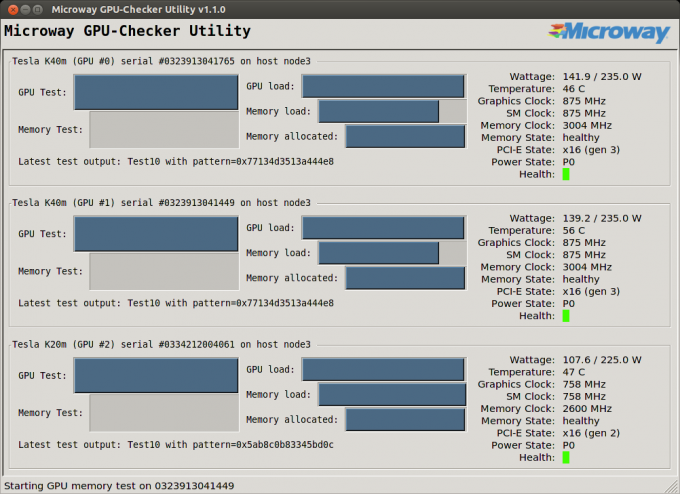 If you would like to learn more about Microway GPU-Checker please contact one of our HPC experts.